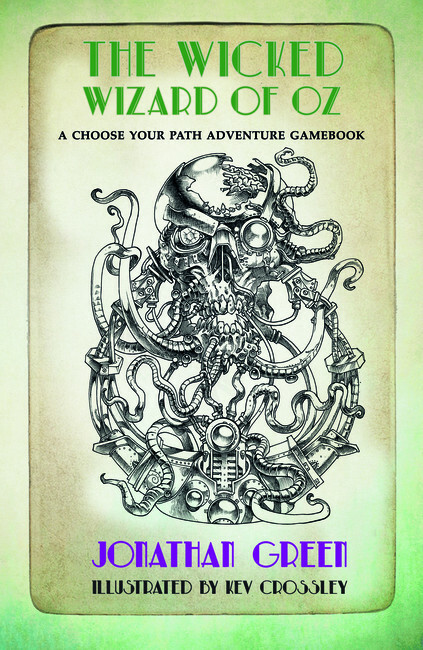 The Wicked Wizard of Oz is a brand new nightmarish gamebook - a multi-path book, very much in the style of Choose Your Own Adventure and Fighting Fantasy Gamebooks, in which you choose the course of the story - inspired by The Wonderful Wizard of Oz, by L. Frank Baum, and the Dieselpunk aesthetic movement. Anybody who has read and played Alice's Nightmare in Wonderland will have a very clear idea of what to expect! Amazon: "I've played a few of Jonathans books such as Howl Of The Werewolf and Alice's Nightmare in Wonderland so I knew this book would be well written. The first thing that strikes you is just how big the book is. It's a whopping 850 sections long. No wonder though, seeing as you can play through the book as any of the 6 characters! I've played through as Dorothy, The Lion and The Tin Woodman so far and each story varies more than enough to make playing through the book as each character worth while. You won't get the feeling that "you've done all this before". The paperback looks very nice next to my Alice book. If you're thinking about buying the hardback version, I highly recommend it. The book is, simply put, stunning. The deep purple looks so rich and the recessed title & icons in green stand out so well."